How can erasure poetry be a means for confrontation and dialogue? What makes a good erasure poem? How can a poet use feedback to revise a visual poem? Whether someone is new to poetry, or is an experienced writer, erasing found text can help poets generate visually-engaging work that responds to power with precision and complexity. In this workshop, participants will analyze different strategies used in erasure poems, try out these strategies by drafting 2-3 erasures of their own, and give and receive feedback on work crafted during the workshop. Readings include poems by Chase Berggrun, jayy dodd, Philip Metres, Isobel O’Hare, M. NourbeSe Philip, and Srikanth Reddy. 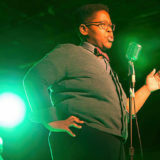 Candace Williams is a black queer nerd living a double life. By day, she’s a sixth grade humanities educator and robotics coach. By night and subway ride, she’s a poet. futureblack, her first full-length manuscript, is a finalist of the 2018 National Poetry Series open competition. In 2018, she released Spells for Black Wizards (The Atlas Review), a winner of the 2017 TAR Chapbook Series. Her work has appeared in the PEN Poetry Series, Tin House Online, Hyperallergic, and Nepantla: An Anthology for Queer Poets of Color (Nightboat Books), among other places. She earned her master’s in education from Stanford University and has received support from Cave Canem, Brooklyn Poets, and the Fine Arts Work Center. Her essays, interviews, and reviews can be found in Electric Literature, VIDA Review, the Fanzine, and Shondaland.